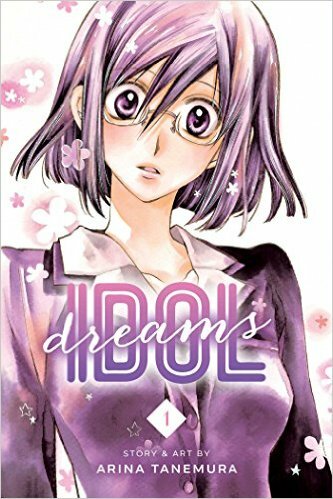 Here we go with another Josh and Liz tag-team review, this time of Idol Dreams! Romantic comedies can often times follow a specific formula and aim to put its own unique spin on it. Then there are those which pull something from completely out of left field that seems a bit absurd on the surface, but then you get this strange feeling that it works, but still doesn’t excuse it from being absurd. That is such the case with Arina Tanemura’s Idol Dreams. The story is about a 31 year old woman by the name of Chikage Deguchi who has taken her life, perhaps, a bit too seriously. While all of her friends throughout high school have lived the life of partying and fun, she was buried in her studies. Now as an adult with her life in a rut, she feels that she worked hard for nothing and that her life has no value. All of this changes one day after meeting a former classmate named Tokita at a class reunion. Tokita works for a pharmaceutical company; after saving Chikage from committing suicide, he gives her a wonder drug that can alter her appearance and make her appear younger. As a younger version of herself, Chikage accidentally gets involved with a talent agency and decides she wants to become an idol. This manga captures that idea of “what if” a lot of us have dreamed of. There are things that we want to change about our past to make sure that our present ends up for the better. People often discuss time travel as a method to achieve such a goal, but rarely does anyone talk about a pill that can change your body to make you appear younger. The idea is so far-fetched that it is borderline ridiculous, but the odd thing about this plot point is that it works, kind of. This is definitely a manga that wants you to suspend your disbelief of the normal. To call this a slice of life romantic comedy would be wrong, in my opinion. The main plot point pushes this into the science fiction realm and if you can look at the story from that perspective, then perhaps you can have a better time believing that a magic pill can set your aging process back by 15 years. The other thing worth noting is that this effect only lasts 5-6 hours and then your body reverts back to normal. The health implications of such rapid transformations cannot be good, but nowhere in the first volume does it speak about the repercussions of abusing this drug. The only warning they give you is that it’s untested and they don’t know what side effects can occur. I imagine that’s going to be a plot point in future volumes as it leaves the manga wide open for a variety of trials and tribulations for Chikage. Another thing this manga tries to do differently is put a spin on the love triangle angle. We’ve seen the whole Girl Aloves Boy A, but Boy B loves Girl A thing before. It’s formula done to death, but the fact that Girl A loves Boy A as a 15 year old and Boy B loves Girl A as a 31 year old makes that formula so much different and dynamic. It’ll be interesting to see how that plays out. Overall, there some pretty decent setups here and the more I think about it, the less I’m bothered by the whole magic pill plot point. I mean, if Chikage went to some “Makeup artist of the stars” and pulled a Mrs. Doubtfire to appear younger, that wouldn’t feel as unique, despite the fact that it would still work for this story. It’s a unique hook and even though I’m still not completely sold on it, I still want to read more to see if Arina Tanemura can manipulate this plot point beyond the predictable and the expected. I know this plot can seem silly but I really think it works. Perhaps this is because I’m the target audience. Volume 1 really spoke to me about how many women feel when they reach mid-level in their professional lives but still feel inexperienced and left out of life landmarks like marriage, dating, and other successes outside of work. The protagonist is definitely good at her job, but she gets blamed for the poor work of others simply because she is less attractive. Her colleagues talk about her behind her back and she doesn’t seem to have any friends until she goes to her high school reunion – where people are surprised to see how much of a loser she has become. I really liked the modern elements in this – Chikage tweets little one liners and readers can see the other end of it – that her colleagues from work follow her twitter account just for laughs. This makes me wonder how the world will react if it ever gets out that Chikage has found a way to transform into a 15 year-old idol. About that – yes the pill idea is a bit far-fetched but this is manga. There is nothing wrong with it; after all, all one has to do is turn on the television to see a slew of advertisements about miracle pills that will make you look younger, skinnier, or have longer hair and nails. I also liked that Chikage begins to obsess over the 15 year old Valentine idol because he looks like the love from high school she never asked out. I wonder where the author is going to go with this – a part of me suspects that he may be Chikage’s actual 15 year old crush, experimenting with a miracle pill himself. Of course that could just be my imagination running away into the world of Idol Dreams. It certainly would be an interesting path although it is probably very unlikely. Like Josh, I am suspecting that we will see something happen with the side-effects of the magic pill further into the series – and I am sure we will see something between Chikage and her old high school pal. While some may think this series is a little silly, I definitely like it and I am pleased to see a manga specifically targeting my demographic. Would it be shameful to admit that I feel like I can relate to Chikage? I certainly wouldn’t mind going back a few years to undo some of my decisions.